Hillary Clinton delivered a huge diss to Donald Trump's supporters while addressing an LGBTQ fundraiser in New York City on Sept. 9. 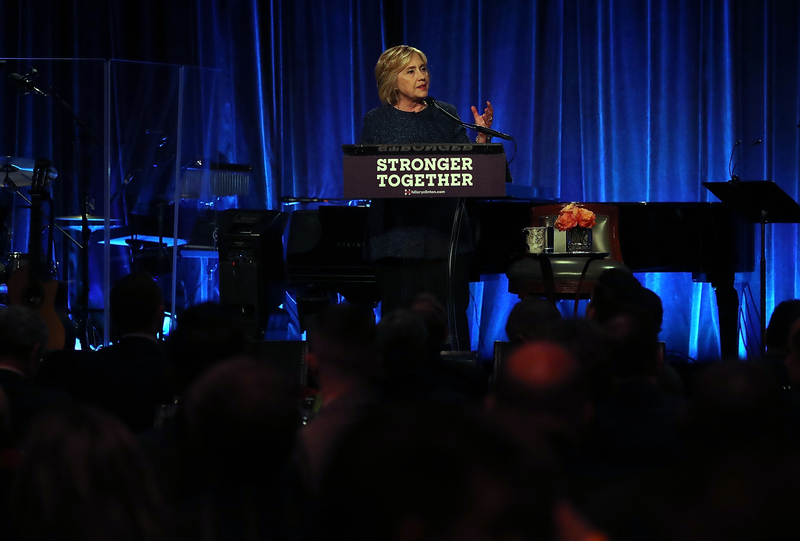 While explaining the growing support behind Trump and his campaign, Clinton said Trump voters were in the "basket of deplorables," openly calling out his supporters as racist, homophobic, and xenophobic. The Democratic candidate admitted that she was making a generalization about Trump supporters, but she seemed to stand firm in her remarks. "You know, to just be grossly generalistic, you could put half of Trump’s supporters into what I call the basket of deplorables," Clinton said in her speech on Friday. "The racist, sexist, homophobic, xenophobic, Islamaphobic — you name it." She added that Trump has not only inspired those potential voters, but validated their beliefs. "He has lifted them up," Clinton said. Clinton's "basket of deplorables" comment came just a day after a poll from Quinnipiac University showed Clinton losing ground to Trump in key battleground states. In Ohio, Clinton is currently polling at 45 percent, with Trump ahead at 46 percent, according to Quinnipiac University. Other polls from Quinnipiac University show Clinton and Trump tied in Florida, and Clinton holding only a slight lead in Pennsylvania and North Carolina. "You know, I’ve been saying at events like this lately, I am all that stands between you and the apocalypse," Clinton told supporters Friday night. "Tonight, I’m all that stands between a much better outcome." Thank you all so much. Wow. Thank you. Thank you. It’s sort of like the seventh inning stretch. Thank you all. You know, I’ve been saying at events like this lately, I am all that stands between you and the apocalypse. Tonight, I’m all that stands between a much better outcome! I want to thank Laverne for being here at her first political event. Her endorsement, her strong words, her passion, her example, her advocacy on behalf of the transgender community, particularly transgender women of color, is just so extraordinary, and I love the way she wove in so many of the issues that are up for grabs in this election. I think we know what we’re up against. We do, don’t we? And if you have read about the ones he says he’s likely to support, he’s not kidding. In fact, if you look at his running mate, his running-mate signed a law that would have allowed businesses to discriminate against LGBT Americans. And there’s so much more than I find deplorable in his campaign: the way that he cozies up to white supremacist, makes racist attacks, calls women pigs, mocks people with disabilities — you can’t make this up. He wants to round up and deport 16 million people, calls our military a disaster. And every day he says something else which I find so personally offensive, but also dangerous. You know, the idea of our country is so rooted in continuing progress that we make together. Our campaign slogan is not just words. We really do believe that we are stronger together. We really do believe that showing respect and appreciation for one another lifts us all up. And it’s a special commitment that I feel to continuing to fight alongside the LGBT community. Because this is one of the continuing struggles. We’re filled in this great hall in Cipriani tonight with successful people, raising your glow sticks, thank you so much for contributing a little bit more to get the campaign over the finish line. But somewhere right now in this city is a kid has been kicked out of his house. Somewhere not far from here, maybe a suburb or across state lines, is a young girl who is just not sure what her future holds because she just doesn’t feel like she’s herself and no one understands that. Some kid getting off the bus at the Port Authority and somebody’s waiting to take advantage of that scared but brave kid looking for a different life and a future that actually belongs to him or her. We still have a lot of work to do. And if you think of the work we have to do in our own country, it pales in comparison to the word we have to do around the world. And I’m grateful that in this room are so many people who have broken down barriers, stood up to discrimination and bigotry, fought for the rights of everyone. I was in North Carolina just yesterday and I told them, it’s not only that discrimination is wrong. It’s bad for business. That state which was led down a pathway of discrimination is seeing the results — losing jobs, losing the NBA all star game. Who wants to be associated with a governor and a legislation who set out to hurt the people they’re supported to be representing and protecting? In too many places still, LGBT Americans are singled out for harassment and violence. You can get married on Saturday, post your pictures on Sunday, and get fired on Monday. That’s why we’ve got to continue the forward march of progress. And we cannot do it alone. I cannot do it alone. I’m not like Donald Trump who says "I alone can fix it." I’ve never quite figured out what it is he alone can fix. And what I hope is that in addition to your extraordinary generosity, you will go to our website, hillaryclinton.com, or text join to JOIN at 47246 to see how else you can get involved. And I want to echo what Chelsea said. We are trying to register 3 million more voters and get those voters to commit to vote. We will win if people turn out to vote. There is no doubt in my mind that we will win. But we can’t take anyone or any place for granted. And therefore I am asking you to volunteer for a phone bank, for a canvas — at the very least if you know anybody who’s even thinking about voting for Trump, stage an intervention! That may be one conversion therapy I endorse. Just remember: Friends don’t let friends vote for Trump. So we’re going to have a great night tonight because we are so blessed. You know, we all love this woman either from afar or luckily enough up close — and for my family, it’s been up close. We know she’s the great talent of our time. We know that remarkably she’s had a number one album in each of the last six decades. We know that. But we also feel and see her heart and her passion. And she’s of course been a great ally and supporter of the LGBT community — but of progressive causes and candidates, she’s been on the front lines repeatedly, bravely, never giving up or giving in to all of the incoming criticism that any of us who stick our necks out often attract. So we’re in for a great treat tonight. I could not be happier, more grateful, or excited, than to introduce a woman of such extraordinary presence, that really just her first name — spelled correctly — is more than enough. Please welcome, Barbra Streisand!